These two images, taken a year apart by NASA’s Hubble Space Telescope, reveal a moon orbiting the dwarf planet 2007 OR10, known informally as “Snow White.” Each image shows the satellite in a different orbital position around its parent body. The third-largest dwarf planet in our solar system has its own moon, a new study reveals. Astronomers used three different telescopes to detect and characterize a moon orbiting 2007 OR10, which is known informally as "Snow White." Most of the Kuiper Belt's large dwarf planets — those at least 600 miles (960 km) in diameter — are now known to host moons, many of which were probably spawned by long-ago collisions. For example, astronomers think a long-ago giant impact led to the formation of Pluto's five-moon system. "The discovery of satellites around all of the known large dwarf planets — except for Sedna — means that, at the time these bodies formed billions of years ago, collisions must have been more frequent, and that's a constraint on the formation models," lead author Csaba Kiss, of the Konkoly Observatory in Budapest, Hungary, said in a statement. "If there were frequent collisions, then it was quite easy to form these satellites," Kiss added. "There must have been a fairly high density of objects, and some of them were massive bodies that were perturbing the orbits of smaller bodies," added co-author John Stansberry, of the Space Telescope Science Institute in Baltimore. "This gravitational stirring may have nudged the bodies out of their orbits and increased their relative velocities, which may have resulted in collisions." The first hints of the newfound moon's existence came via NASA's planet-hunting Kepler space telescope, which noticed that Snow White takes about 45 hours to complete one rotation. That's much longer than the typical Kuiper Belt object, which tends to spin once every 24 hours or less, study team members said. The slow rotation could be caused by a moon's gravitational tug, the researchers reasoned. So they went through archival images of Snow White that were captured by NASA's Hubble Space Telescope, and hit the jackpot in two observations made a year apart, in fall 2009 and fall 2010. 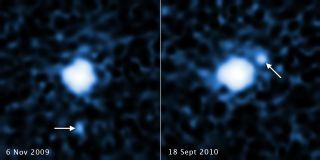 This sequence of images, taken by the Hubble Space Telescope's Wide Field Camera 3, shows a moon circling the dwarf planet 2007 OR10, informally known as “Snow White.” The top four images were taken Nov. 6, 2009; the bottom four, on Sept. 18, 2010. The Hubble photos didn't provide enough information for the study team members to calculate an orbit for the newfound moon, or to determine its size. But the astronomers were able to get their diameter estimate for the satellite by studying archival measurements made in far-infrared light by the European Space Agency's Herschel Space Observatory, which ceased operating in 2013. The study was published online in March in The Astrophysical Journal Letters.